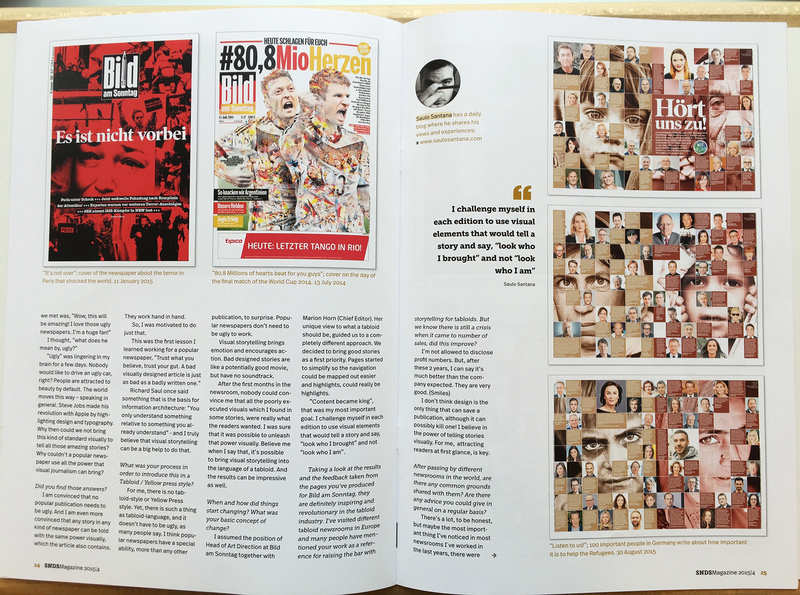 Many people ask me about my experience working in a tabloid newspaper and bringing visual storytelling to it. 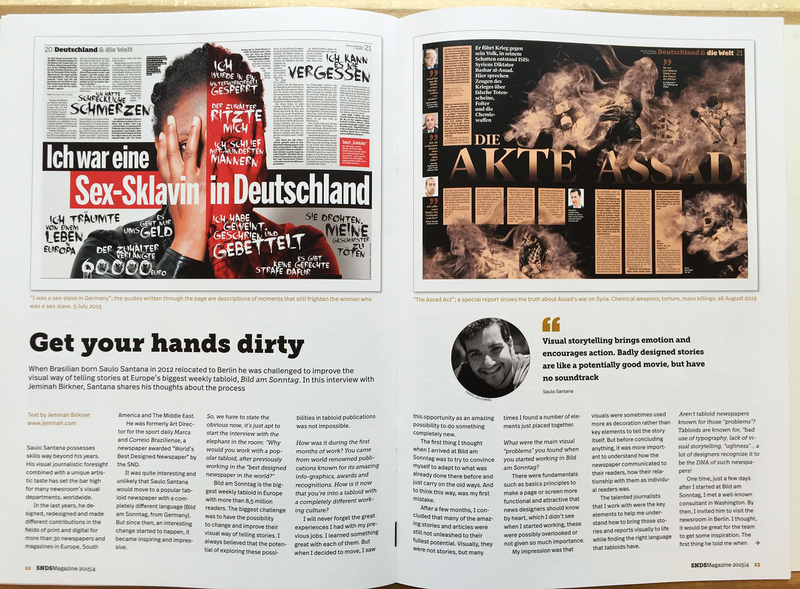 I was interviewed by the SNDs Magazine, published in the Scandinavia countries, where I talk about it and about the power of telling stories visually. “What was your process in order to introduce this in a Tabloid / Yellow press style? For me, there is no tabloid-style or Yellow Press style. Yet, there is such a thing as tabloid-language, and it doesn’t have to be ugly, as many people say. I think popular newspapers have a special ability, more than any other publication, to surprise. Popular newspapers don’t need to be ugly to work. Visual storytelling brings emotion and encourages action. Bad designed stories are like a potentially good movie, but have no soundtrack. 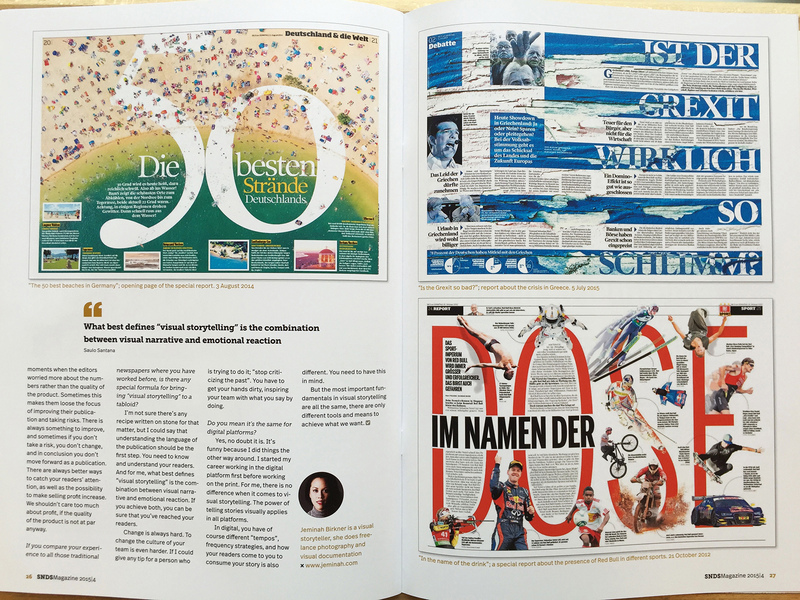 “I’ve visited different tabloid newsrooms in Europe and many people have mentioned your work as a reference for raising the bar with storytelling for tabloids. But we know there is still a crisis when it came to number of sales, did this improve? “If you compare your experience to all those traditional newspapers where you have worked before, is there any special formula for bringing “visual storytelling” to a tabloid? I’m not sure there’s any recipe written on stone for that matter, but I could say that understanding the language of the publication should be the first step. You need to know and understand your readers. And for me, what best defines “visual storytelling” is the combination between visual narrative and emotional reaction. If you achieve both, you can be sure that you’ve reached your readers.